Ruins of the Yuanming Yuan - 1709 " Garden of Perfection & Brightness." " The development of human being's civilization is based on mutual understanding, tolerance and respect. Famous gardens, being plundered and razed are not only the disasters of the civilization, but also the shame of human beings. 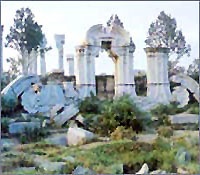 To protect gardens and cultural relics are human being's collective responsibility." The above article featured in the CHP Heritage Update e-newsletter Volume 3 Issue 11 of November 28th, 2008. Ke Yuan Conserved or Destroyed ? Trees in Pots Limited - established initial contact with the CHP, back in early 2007 and discussed at that time - the hope that they would include Classical Chinese Gardens within the scope of " cultural heritage assets," and the CHP shared such a view. CHINA'S Garden Art Heritage Preservationist. as established by the ancient literati scholars.
" Place and Memory in the Singing Crane Garden." - Vera Schwarcz. Please visit, through LINKAGE: How different to the West ? If it interests you, scroll down the left side of their web site and watch the videos China Environmental Law 1 and / or 2. An unfortunate identity - for a flat-bottomed Chinese sailing boat ?